Sometimes they came as close as 2 meters. Incredible experience!! 465.9 kB, 555 x 823 Pixel. Thank you all for your comments. It's much appreciated. I am not that actively participating in this forum anymore but your pictures are always worth a comment. This is again a stunning intimate picture. 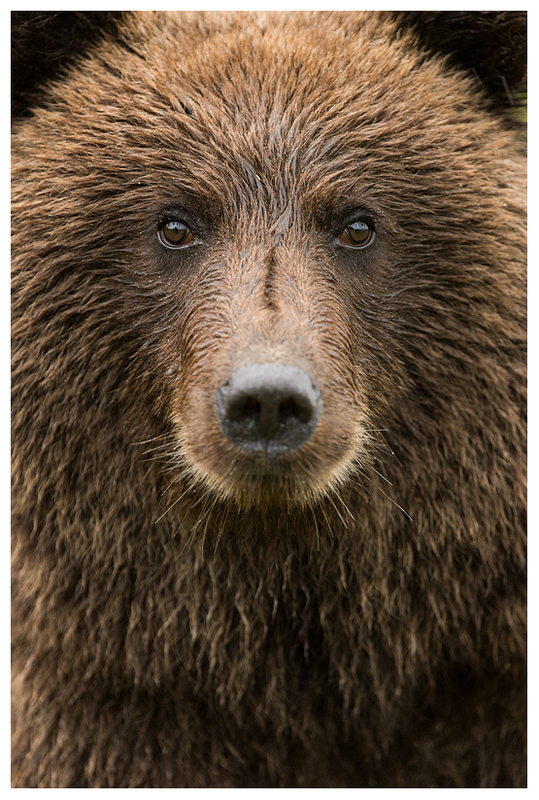 The perceived friendliness in the face of the bear is probably misleading but gives the picture a gentle touch. Outstanding Edwin, this is really an amazing shot. Very keen and haunting look. Happy for you having such experiences in your memory. really fantastic, as I already wrote on another page. Also the pics in your blog are awesome! Happy to see that you had a good trip to Alaska! A place I also have to go once. ein ganz großartiges Bild, aber kaum zum Nachahmen geeignet. Man hat keine Chance mehr sich zurückzuziehen. War jemand aus eurer Gruppe bewaffnet? Im Nationalpark Lake Clarke? Was sagen denn da die Ranger dazu? Würde mich interessieren! Das ist wirklich schon fast zu nah Edwin...dennoch, oder gerade deshalb ein eindrückliches Portrait.